파트타임스위트는 2010년 9월, 민간인 출입 통제선 부근을 구부정하게 횡단하는 프로젝트 [드롭바이덴]을 진행했다. 서울-문산-연천-철월-화천-양구-인제-간성-서울로 이어진 10일간의 여정은 기록된 미디어에 따라 나누어 공개되었다. [러캐스트]는 문산, 연천, 철원, 화천, 인제 등지를 여행하면서 그 사이 만난 사람들이 해 준 이야기들 (혹은 그냥 던진 말들)을 기록, 멤버들이 무작위로 낭송한 것이다. 이야기를 들려주신 분들은 태풍전망대의 군인, 연천 군남삼거리에서 만난 아저씨, 파로호 민박집 주인 할머니 등이다. 낭송한 텍스트는 녹취한 것과 멤버들이 기억에 의존해 정리한 내용 모두가 포함되었으며, 파로호에서 녹음하고 여행 중 홈페이지를 통해 공개하였다. Raw Cast consists of stories and random remarks, told or made by townsfolk we met on our trip to anumber of cities including Moonsan, Yeoncheon, Cheolwon, Hwacheon and Inje, documented and recited by Part-time Suite members. A soldier we met at Typoon Observation Platform, a middle-aged man at Gun-nam junction in Yeoncheon and an elderly lady who kept a guest house near Paro lake, and some others spoke to us, and for us. Some of the words we repeated in the work had been recorded and written down and others just recalled from our memory. It is recorded near Paro Lake, and broadcast online on our homepage during the journey. 2010년 9월 파트타임스위트는 열흘 동안 민간인 출입통제선 부근을 횡단하는 프로젝트 [드롭 바이 덴]을 진행했다. 이 프로젝트는 파트타임스위트가 그동안 도시 속 공간을 일시적으로 점유하고 이동하던 방식을 변화, 확장해 보고자 기획되었다. 여행의 루트는 대략적으로 계획되었고, 방문지역 및 명소 역시 여행 도중 상황에 따라 선택되었다. 비교적 짧은 여행 기간 때문에 파로호를 제외하면 잠시 쉬거나 투숙을 위해 한 곳에 하루 이상 머물 수 없었으며, 백학 저수지, 노동당사, 임진강, 태풍전망대 등의 명소에서도 반나절 이상 지체할 수 없었다. [드롭 바이 덴: 비디오]는 마치 속도전과 같이 치러진 열흘 간의 여행 기록이면서 그 와중에 촬영되고 채집된 풍경과 말들의 나열이기도 하다. 세 명의 멤버들이 동시다발적으로 촬영한 다량의 영상 대부분은 영락없는 지방도시의 풍경, 그 이상도 이하도 아니지만, 느닷없이 마주치게 되는 검문과 제재, 보안과 전쟁의 이미지들은 과거의 공포가 속속 내려앉은 현재의 모습과 지속되는 긴장을 상기시킨다. 영상에서는 분할화면을 과감하게 시도하면서 이미지와 텍스트의 중첩과 배치, 그리고 리듬을 적극적으로 활용하였다. [드롭 바이 덴: 비디오]는 촬영된 영상들과 함께 파트타임스위트가 여행 도중 즉흥적으로 진행한 세 개의 단편적 퍼포먼스도 포함한다. 파로호에서는 근처 낚시 가게에서 구입한 부표와 야광 캐미로 가라앉지 않는 작은 그물을 제작하여 밤새 그 이동을 지켜보았고, 그동안 길 위에서 마주친 사람들의 이야기들을 채집, 무작위로 낭송한 [러캐스트(2010)]를 진행했다. 또한 연천군 신서면에 속한 5번 국도 내 민간인 통제구역에서는 약 15분간 하차하여 새벽 도로를 따라 걸었다. 이 작업들은 하나의 특정한 장소 혹은 구역에서 단발적으로 이루어졌지만 지역적 풍경과 함께 여행 전반의 과정을 함축한다. Last September, Part-time Suite took on a project called Drop by Then, which involved traversing the northernmost region of South Korea bordering the Demilitarized Zone. The project was a new, expansive approach on Part-time Suite's work methodology. While Part-time Suite had usually begun a project with occupying a certain space in the city in the past shows, now the collective group did with setting out on a journey. When the group did embarked on the trip, their schedule and route were far from well-planned. Decisions as to what cities or places to visit were made just as they came every day. Pressed for time, the artists couldn’t take a long rest or stay in a place for more than one night, with one exception of Paro Lake, nor linger for longer than a few hours even in famous attractions such as Baekhak Reservoir, The former Labor Party Headquarter, Imjin River, and Taepung Observatory. Drop by Then: Video is both a documentary about a journey that the artists rushed on in a short 10 days and a compilation of sceneries and words Part-time Suite taped and recorded on the way. All three members of the group simultaneously filmed an immense amount of pictures, which looks like nothing but stereotypical small towns in Korea far from Seoul at first glance, but also spotted with rather sudden images of questioning, restriction, security and war. That reminds the viewer of how the fear from the past has haunted the present there and how the tension persists. The film frequently uses the technique of split screens, as well as juxtaposition of both images and texts, and generates distinct effects with the composition and the rhythm. 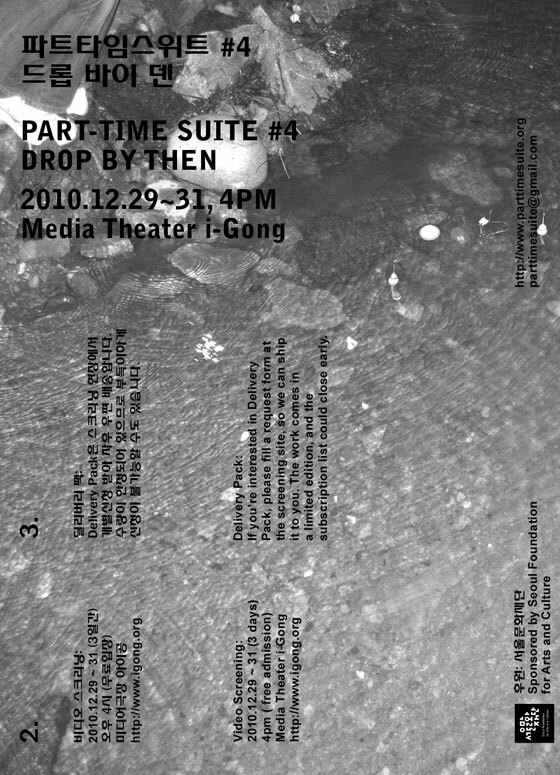 Also featured in Drop by Then: Video are three performances that Part-time Suite improvised during the trip. At Paro Lake, the group bought some luminescent buoys at a local fishing store, which were attached to a net. The artists floated the net on the lake and watched it moving all night. The team also broadcast Raw Cast via the Web during the journey, which was a randomly recited collection of stories and remarks that were told or made by people the artists met on the way. On a section of Line 5, a restricted area for civilians in Sinseo-meon, Yeonchun, they got off the car and walked along the dawning road for about 15 minutes. Although the performances were performed only once at single locations, they represent the whole process of the journey as well as a taste of local sceneries. [드롭바이덴: 낱 풍경]은 [러캐스트], [드롭바이덴: 비디오]에 이은 여행프로젝트 [드롭바이덴]의 마지막 결과물이다. 72장의 드로잉들은 여행을 사진이 아닌 드로잉으로 기록해보자는 애초의 계획을 조금은 늦게 실행해 본 것으로, 여행 중 촬영된 사진을 바탕으로 각 멤버들이 자유롭게 선택, 그린 것이다. 먹지를 대고 여행 경로를 표시한 지도 사이즈의 포스터와 태풍전망대에서 몰래 촬영된 북쪽 DMZ의 풍경사진이 동봉되어 신청자에게 무료로 배송된다. Drop by Then: Pieces of the Scenery, preceded by Raw Cast and Drop by Then: Video, is the final end-product of our travelling project Drop by Then. The 72 drawings are a belated result of our first plan, prior to the project, to record our journey by means of drawing, instead of taking photos. We used carbon paper to mark the route of our trip on the poster, which is about the size of an actual map. Also packed inside is a photograph of DMZ to the north, that we secretly took at the Taepung observatory. his package has been mailed to subscribers for free.